The following are generalised figures for the height, length and weight of Red deer. As David Macdonald and Priscilla Barrett point out in their Field Guide to the Mammals of Britain and Europe, measurements of deer vary considerably according to habitat, population density and prevailing conditions. The mammologists also note that there is a distinct east-west cline, with animals in the east (e.g. in Scotland) being smaller than those in the west (e.g. North America), although if one subtracts the wapiti—which aren’t the same species—the difference is more subtle. Indeed, in his Deer of the World, Valerius Geist considers the view that Red and wapiti deer form a gradual cline to be “unfounded”. 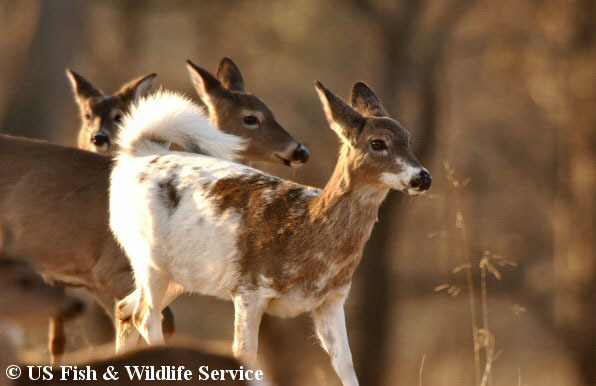 Overall, there is tremendous variation in size across their range, with deer living in poor habitat being stunted in both overall size and antler development. At the lower end of the size range is probably the Corsican Red deer, which typically weigh in at 80 kg (176 lbs), while those of the Carpathian Mountains sit at the other end of the scale, attaining weights of six-times this. Red deer have a short, rich red-brown summer coat with little or no underwool, which starts to grow around May-time and is typically complete by late July or early August – the hair is a fairly consistent red-brown colour along its five centimetre-or-so (2 in.) length. During September, a longer, coarser (hair is slightly corrugated) grey-brown winter coat starts to grow, and is complete by the end of the year. The winter coat is accompanied by a layer of underwool about two centimetres (1 in.) thick; the hair colour changes from pale brown at the base to very dark brown or black in the middle and light red-brown at the tip. 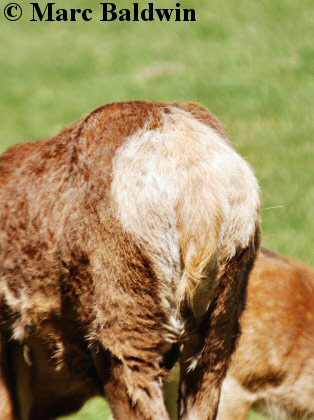 The rump patch is a yellowish or cream colour (see below left), with a short beige-coloured tail; rump patch colour varies tremendously in relation to geography and this is a feature commonly used as a distinguishing feature of subspecies. 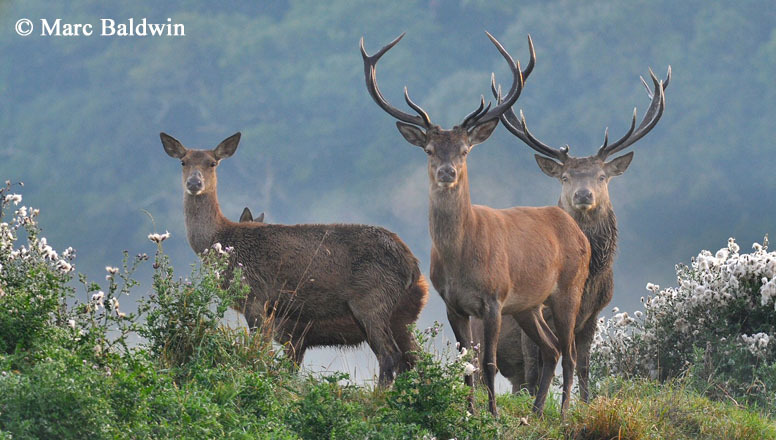 Similarly, stags in some regions develop a mane during the autumn that’s carried for the winter months (e.g. in Britain); the mane is typically slightly darker in colour than the rest of the coat and may be accompanied by a dark stripe down the animal’s back. The colour of the fur on the underside varies from off-white to yellowish or grey and on a rutting stag it may be heavily stained with urine and mud (giving a dark brown or black appearance). The overall colour of the animal may vary according to location: Red deer residing between the Black and Caspian seas (the Caspian Red deer), for example, have a more uniformly-grey coat and lighter rump patch than those in Europe. Newborn deer are spotted for the first few months of life, but spots are uncommon on adult coats, although on occasion adults have been observed with a double row of spots running down the back. Calves undergo two moults in their first year: the neonatal “pomeled” (spotted) coat, which is shed at about two months old, is followed by the growth of the winter coat during the autumn. Older stags and those in better condition generally begin and complete their moult before younger animals; the moult starts at the front of the body (i.e. head, legs etc) and progresses posteriorly. Deviations from the ‘typical’ colouration seem rare, although as mentioned, some individuals may be darker or lighter than others. Records of albino Red deer are rare; non-albino white ‘morphs’ are reported more frequently. In his Whitehead Encyclopaedia of Deer, Kenneth Whitehead notes that white morphs of the Red deer have been preserved in deer parks, most notably Kinmonth in Perthshire, Charborough in Dorset, Woburn in Bedfordshire and Zleby in Czechoslovakia. Presumably, some of these herds are no longer present because, to the best of my knowledge, the only herd of white Red deer currently in the UK are held at the South West Deer Rescue in Devon. It seems that entirely or predominantly white individuals are occasionally reported from the wild, including sightings in the Scottish deer forests, Scotland’s Corrie Ba and on the Quantocks in Devon. There are also various legends, superstitions and stories involving white deer, most notably stags, including that of David I of Scotland, who was apparently almost killed by a white stag in 1128, and the legend of a young white stag befriended by locals on the Island of Arran off Scotland’s west coast – unfortunately, the stag became too bold and was eventually shot by the estate’s Head Keeper in December 1970. Colour variations may also take the form of “bald-faced” or white-faced individuals, which exhibit white patches on their heads, varying in size from a small patch on the forehead to a large white band down the length of the face between the eyes, or even a completely white face; individuals may also have white ‘socks’. Additionally, in their contribution to Mammals of the British Isles: Handbook, 4th Edition, Brian Staines, Jochen Langbein and Tim Burkitt mention that the summer coat is “sometimes whitish or skewbald [patches of white]”, an observation also made by Mr Whitehead. 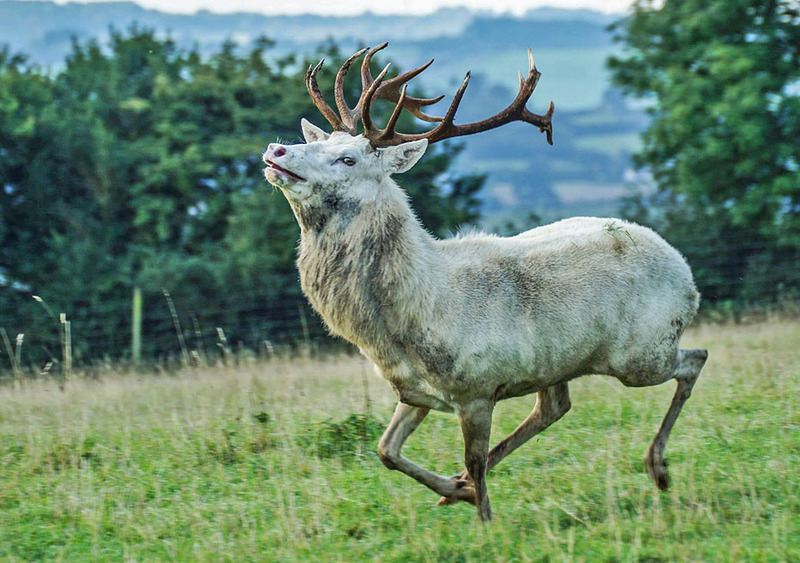 Indeed, it seems that pure white morphs are uncommon and, in her 1991 book Deer, Norma Chapman notes that although white morphs of Cervus elaphus have been documented, they are seldom entirely white – they usually have a patch of red on them somewhere. Interestingly, none of the aforementioned authors make mention of melanistic (very dark or black) forms.